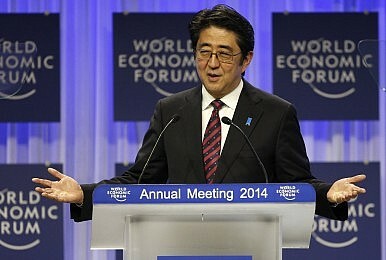 Abe’s reference at Davos could draw Japan’s attention to some useful lessons from that era. Responding to a question on the conceivability of a war between the two largest economies in Asia, Japanese Prime Minister Shinzo Abe made waves at Davos last week when he compared ongoing tensions between Japan and China to Anglo-German relations in the period leading up to the First World War. Although a sobering reminder that the world does not resemble the neo-liberal utopian dream of Thomas Friedman, this reply was a poorly timed statement that will serve only to put further distance between two countries whose relations are already frayed following Abe’s visit to Yasukuni Shrine and Beijing’s unilateral declaration of an Air Defense Identification Zone around the disputed islets in the East China Sea. At the same time, there is more to the seemingly anachronistic analogy than first meets the eye. The war in 1914 played a critical role in informing the nascent Japanese Empire about its strategic limitations in the modern era. It was the lessons from the German defeat in particular that emboldened Japan to pursue territory in mainland China and sowed the seeds for the discord that has relentlessly stymied closer ties with China in recent years. Indeed, Abe drawing attention to the First World War can be seen as equal parts caution to Beijing and an admission that Japan still struggles from the same strategic limitations it faced a hundred years ago. Watching the protracted European conflict that followed the assassination of Archduke Franz Ferdinand, many officers in the Japanese military were alarmed by the changing nature of modern war. Throughout the first decade of the twentieth century, strategists had concentrated on mobilizing troops as quickly as possible, but not on the mustering of the national economy to support a prolonged war. The defeat of Germany proved that modern wars would inevitably involve attrition and that reliance on other countries for critical resources in the war effort would only guarantee defeat. For Japan, which had adopted sweeping economic and political reforms to ensure its sovereignty in the eyes of Western powers, this new insecurity fed directly into its growing impulse for an empire. Of course the true tragedy here is the immense human suffering that resulted from the extreme brutality with which Tokyo pursued its futile venture, a point not often made by Japanese leaders invoking modern history. Thus, if the reference to the First World War was a conscious or unconscious appeal to Japan’s modern day insecurities, then Chief Spokesman for the Chinese Foreign Ministry Qin Gang’s comment that the Japanese leader was “saying these things for the purpose of escaping Japan’s history of aggression” may have been fairly perceptive. The fundamental conditions in East Asia today, from security alignments to the presence of civil society, are in fact nothing like those of Europe in 1914. As Chinese Foreign Minister Wang Yi noted in response to Abe’s comments, “There’s a world of difference between the current era and 100 years ago… forces of peace in the world are growing. Peace is assured.” However, the end-goal of any state is bound to take shape in ensuring the nation’s welfare or upholding its prestige relative to other states and while the blunt tools of military might may be rendered inapplicable for now, there are always other means to gain leverage. One area where Japan’s high-tech economy is vulnerable is in the import of rare earth elements, core materials used in the manufacturing of cutting-edge goods such as missile defense systems and lasers. While Japan is assiduously recycling rare earth elements, China controls around 95 percent of the world’s rare earth market, aided by its lax environmental and labor regulations. This has left high-tech manufacturing economies heavily dependent on China for the supply of these precious resources, none more so than Japan, which consumes nearly a third of China’s exports. Therefore, when China announced in 2010 that it would reduce total rare earth exports by 40 percent in the second half of 2010, Tokyo had much at stake. Beijing’s rationale for the export quota was that it wanted to address the serious environmental impact of the mining operations. Nevertheless, with the announcement being made in the aftermath of the collision between a Chinese trawler and a Japanese coast guard vessel, accusations that Beijing was using economic levers for geopolitical gains naturally followed. This dubious claim was encouraged by Japan’s emphasis on the “China risk” and announcement of resources set aside for measures to reduce its dependence on Chinese mineral resources. The public perception that China was punishing Japan economically over the dispute in the East China Sea certainly played into Tokyo’s hand when it, alongside Washington and Brussels, challenged Beijing’s export quota at the WTO in 2012. With the WTO’s October 2013 ruling against China, Japan won a small victory in ensuring its economic security, especially at a time when the yen devaluation promises to increase Japanese exports. But just as the expansionist policies of Imperial Japan were contradictory to the aims and goals of the state, so too are Tokyo’s inflammatory postures today. Abe has built a political consensus around the goal of reviving the Japanese economy from the malaise of its lost decades, but maintaining unity in the ever fragile world of Japanese politics has perhaps required him to appeal to the desire of some for historical vindication. Such gestures damage ties with Japan’s neighbors and this in turn has diminished Japan’s economic growth potential by setting back the efforts for greater liberalization of trade in the region. According to a study by Nomura Securities, a major Tokyo-based financial service group, a trilateral free trade agreement between Japan, South Korea, and China would increase Japan’s potential GDP growth by 0.74 percent, exceeding the 0.54 percent addition expected with Japan’s entry in the Trans-Pacific Partnership. However, even the preliminary negotiations for a basic framework for such a trade agreement in the region has been rendered impossible by regional leaders’ refusal to meet with Abe. Consequently, the visit to Yasukuni Shrine and support for Japan’s revisionist history all simply contribute to undermining the end goal that the Abe administration has set for itself: Japan’s economic revival. In reminding the world of Japan’s insecurities by invoking the breakdown of the European order, Abe has also offered a lesson as to why his actions are ultimately self-defeating. As former chairman of the Japan Federation of Economic Organizations Imai Takashi frankly stated “Japan is a country without resources, so it must create a free trade world… in a sense, Japan must promote free trade and technological development in order to survive.” Perhaps the Japanese leadership should use Abe’s historical reference to recall the consequences of the policy choices made after the First World War, and recognize that bellicosity will only stress the country’s strategic weakness. Yong Kwon writes Asia-Pacific history, economics, and geopolitics. He is the chief editor of the DPRK Food Policy Blog, focusing his research on the nexus between North Korean monetary policy, industry and agriculture. Follow Yong on Twitter @ykwon88. Taiwan Elections: An Opportunity for Japan? Tsai Ing-wen’s victory was greeted with enthusiasm in Tokyo. Japan’s Security Bills: Overpromising and Under-DeliveringAPEC Summit: Will It Matter for Northeast Asia?China and Japan: Uprating National SecurityThe Art of the Balance: Japan, China and the United StatesWill Japan and Russia Finally Settle Their Territorial Dispute?